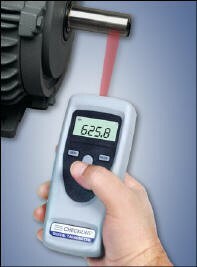 Checkline CDT-1000HD Hand Held Tachometers Reliability Direct, Inc. Your Direct Source for Reliability, Maintenance, Test & Measurement! The CHECK-LINE® CDT-1000HD Hand-Held Digital Tachometer accurately measures rotational speed (RPM) using a visible beam of light. The CDT-1000HD can be up to 24 inches away from the small piece of reflective tape that is affixed to the rotating element. The CDT-1000HD's rugged construction, portability and outstanding features make it an ideal choice for maintenance personnel, machine operators or others in a wide variety of machinery and material handling applications. CDT-1000HD is supplied as a complete kit, including the tachometer, reflective tape, two AA batteries (1.5V), operating instruction manual and an NIST certificate - all supplied in a foam-fitted, hard plastic carrying case. Memory Indicators: Indicates which measurement stored in memory (last, max., min., avg) is displayed. Low Battery Indicator: Illuminates to indicate that batteries need replacement. MEM Key: Accesses the memory. Each time the key is pressed the values stored in memory will be displayed. MODE Key: Not functional in this model. Battery Life: 30 hours continuous use, approx.